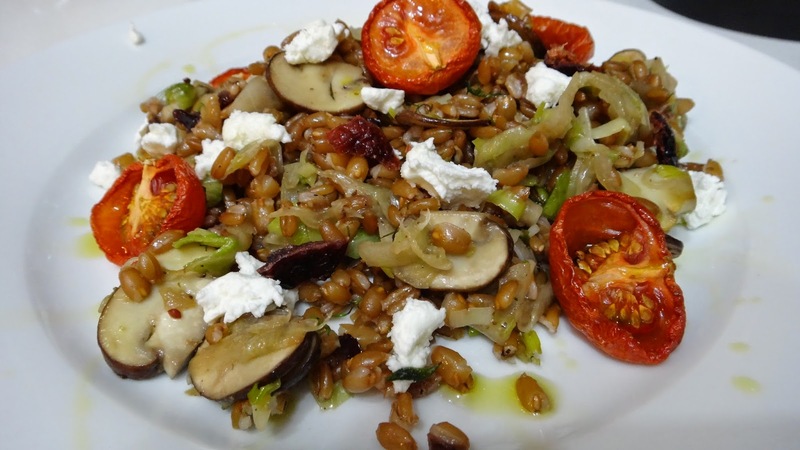 This is a delicious nutty salad with roasted or sauteed vegetables, farro, (also called wheat berries) some dried cranberries and some lovely fresh goat cheese. While the farro is cooking on the stove you can roast some veggies in the oven. 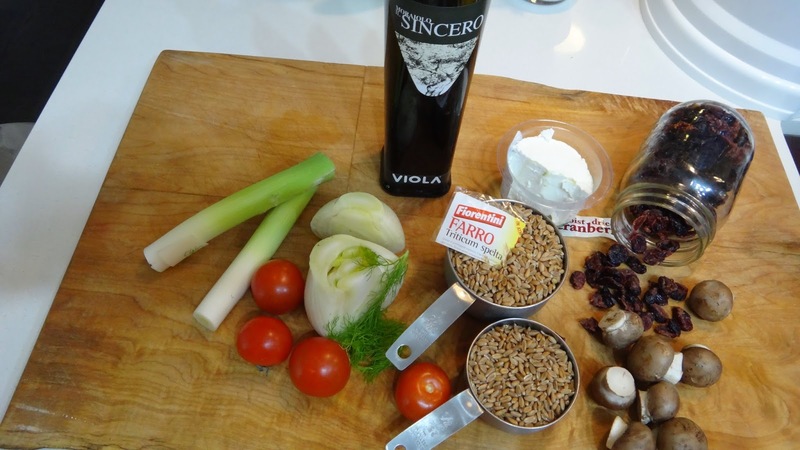 Toss with some beautiful Olive Oil like the Viola Sincero oil I used. Makes a great lunch or dinner. I always like to gather all my ingredients together so I don’t forget something! 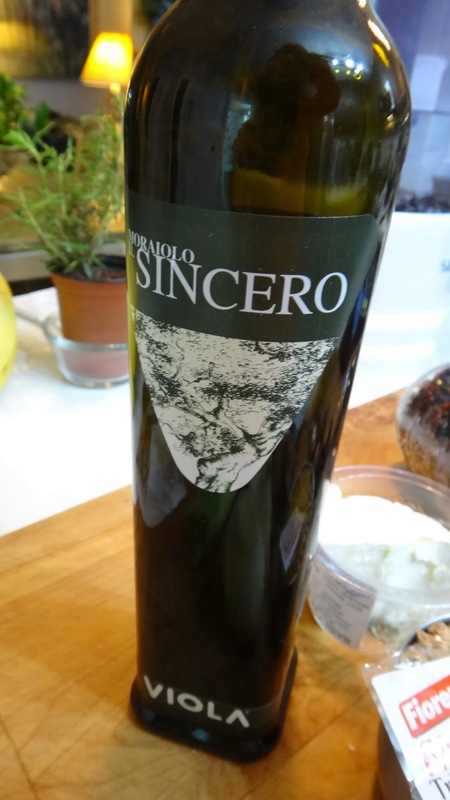 Step 1: in a large pot add 2-3 tbsp of great extra virgin olive oil like this Viola Sincero which is a Moraiolo from Umbria, Italy. 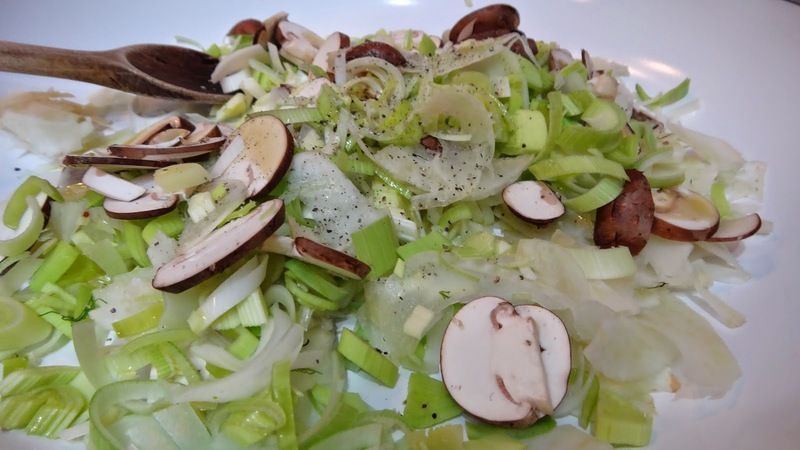 You want something that is medium or robust to match this hearty salad. 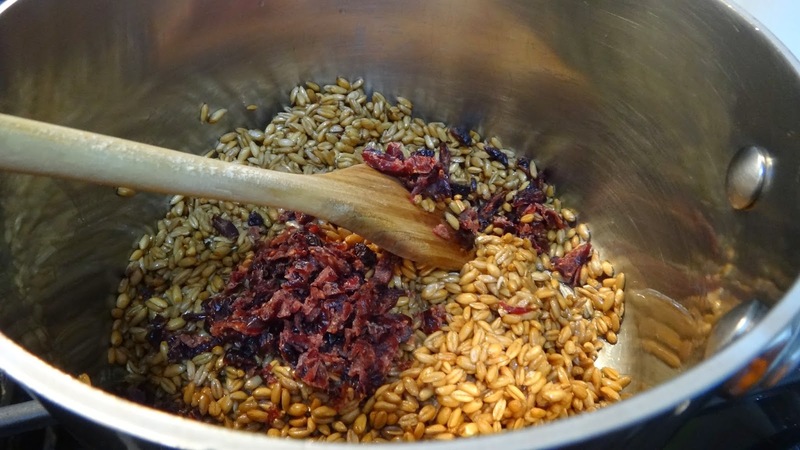 Step 2: turn on heat to medium and add the farro and the chopped cranberries. 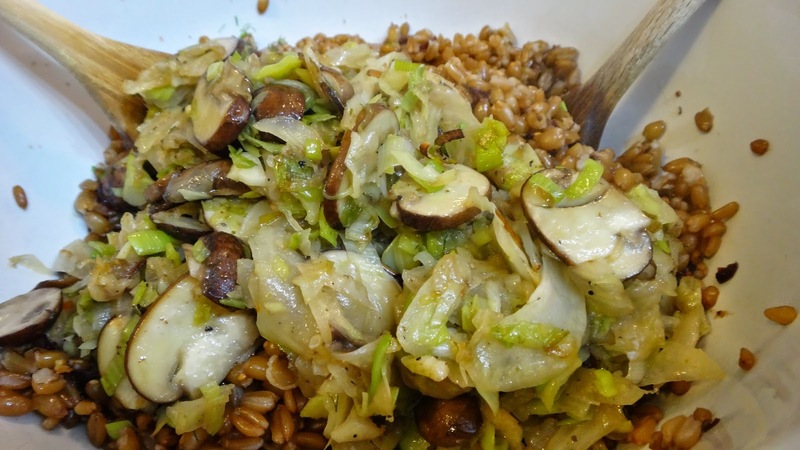 Saute for 5 minutes to toast farro, stirring to avoid burning. 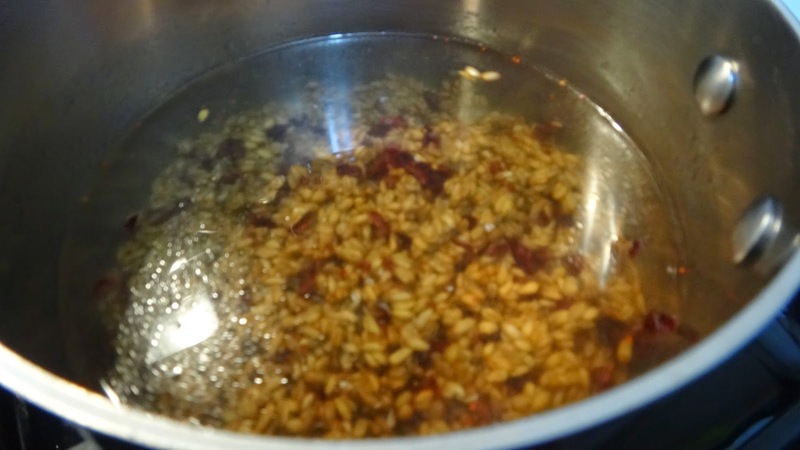 Step 3: add the water and let come to a boil, then turn down to simmer for 50 minutes until tender. 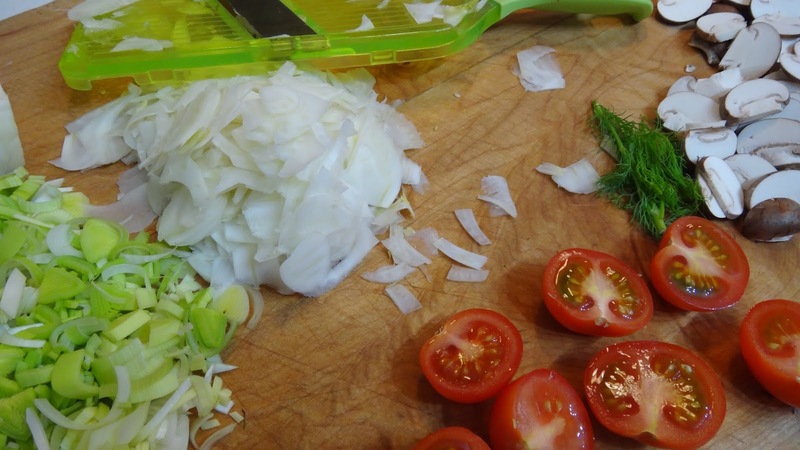 Step 4: shave fennel, slice leeks, mushrooms, tomatoes and garlic. 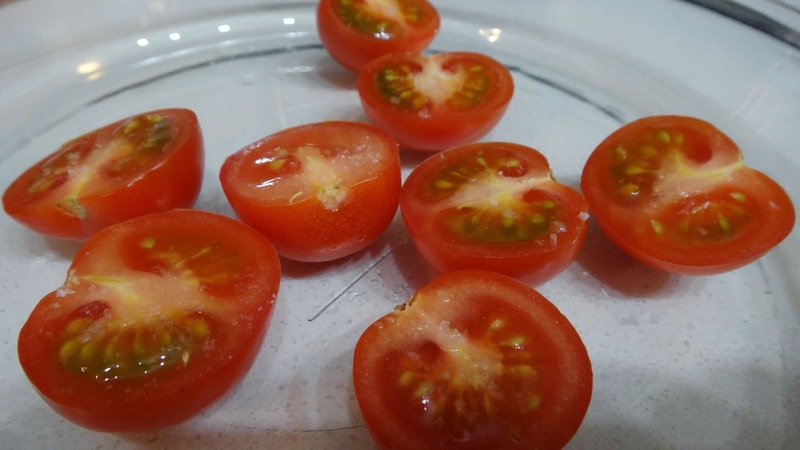 Step 5: place sliced tomatoes on a plate with a bit of olive oil, salt, pepper and roast in a 425 degree F oven for 20-30 minutes or until partially dried and slightly browned. You could roast all the vegetables if you like in the oven. I would suggest making the pieces larger to ensure they all cook evenly in that case. 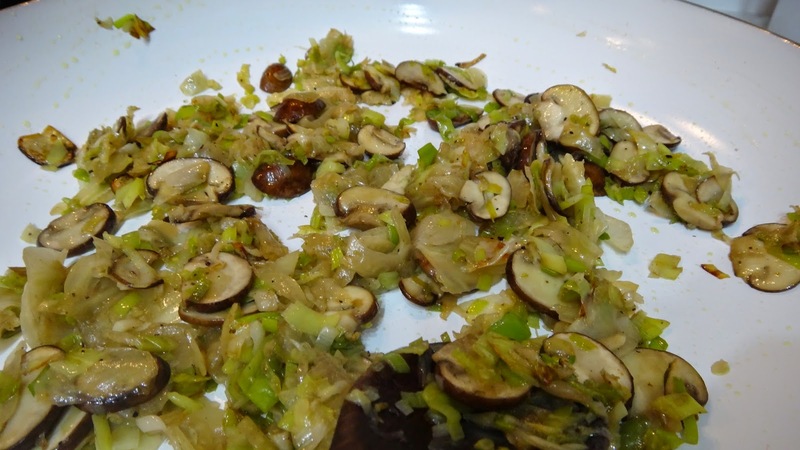 Step 6: in a hot saute pan with the remaining 2-3 tbsp olive oil saute leeks, fennel, mushrooms and garlic for a few minutes on medium-high heat until browned and cooked. Add salt and pepper to taste. 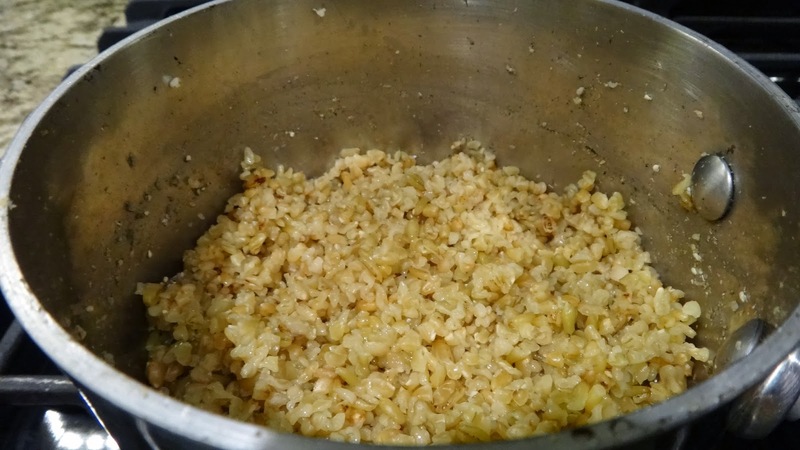 Step 7: drain farro and add to a large bowl. 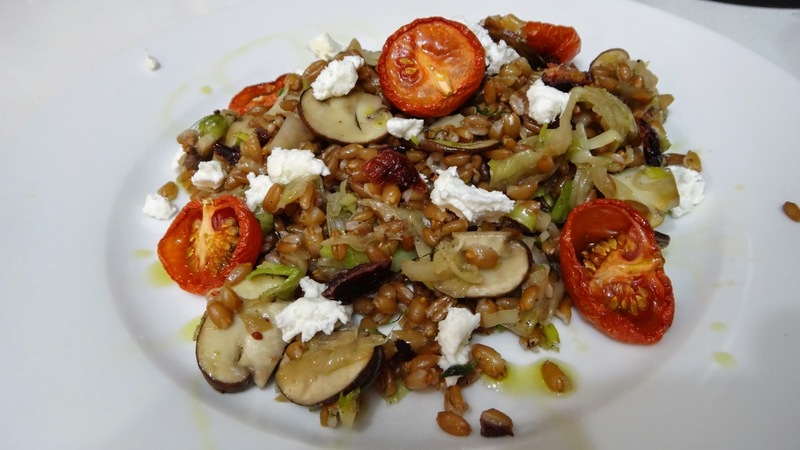 Step 8: toss vegetables with farro. Taste and adjust salt and pepper. Add a few more chopped cranberries for a chewier taste. Serve on two plates dividing roasted tomatoes and adding some globs of fresh goat cheese and a final drizzle of fresh oil for an addition level of raw olive oil. 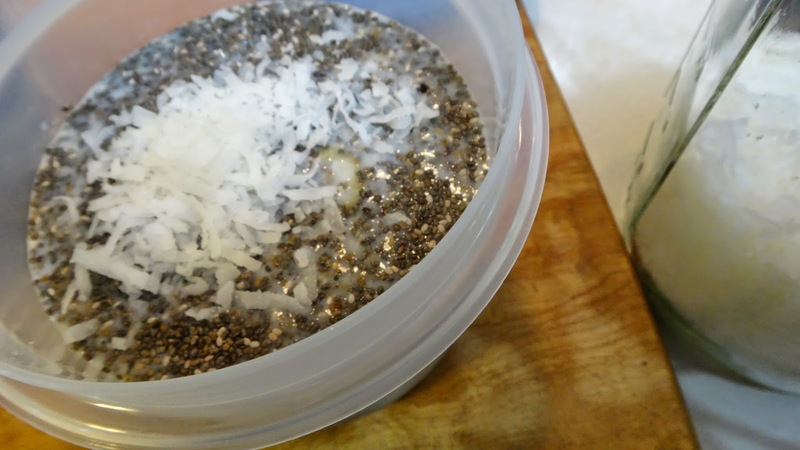 Despite their tiny size Chia seeds are jammed packed full of good stuff. 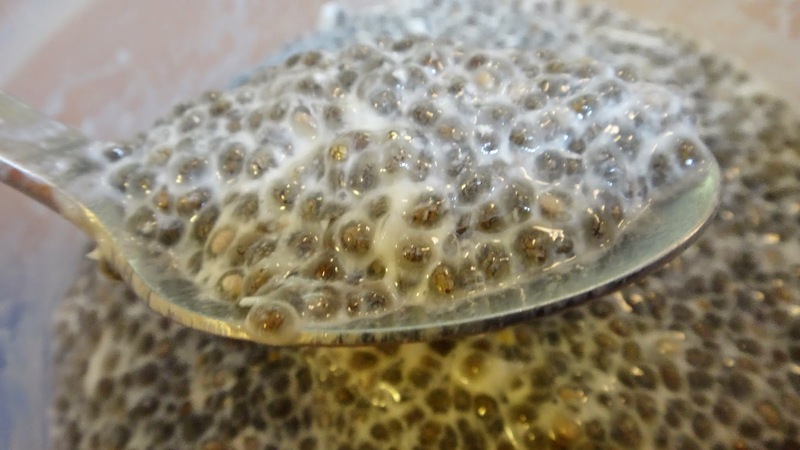 They are loaded with fibre, protein, Omega 3 fatty acids, calcium, magnesium, manganese and other anti-oxidants. This is a super easy pudding that I first tried in Hawaii a few months ago for breakfast. All you do is soak the seeds overnight in almond milk and in the morning top this jelly like caviar pudding with fruit and granola. 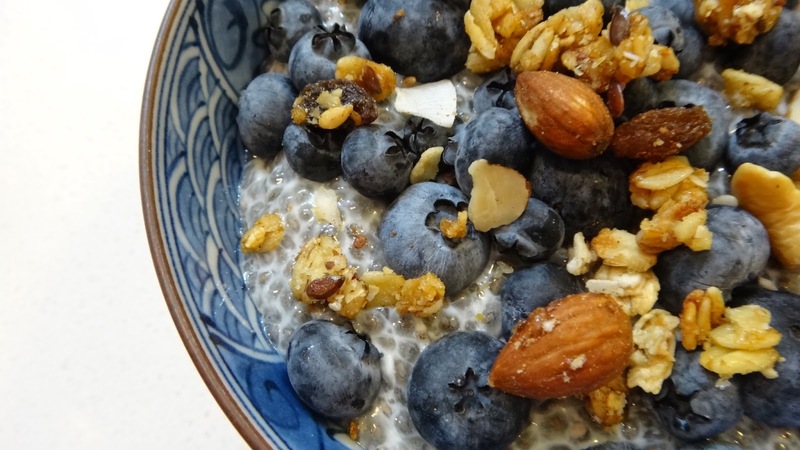 I like adding blueberries because they pop in your mouth like the Chia seeds. Try it you might just find a new breakfast option. 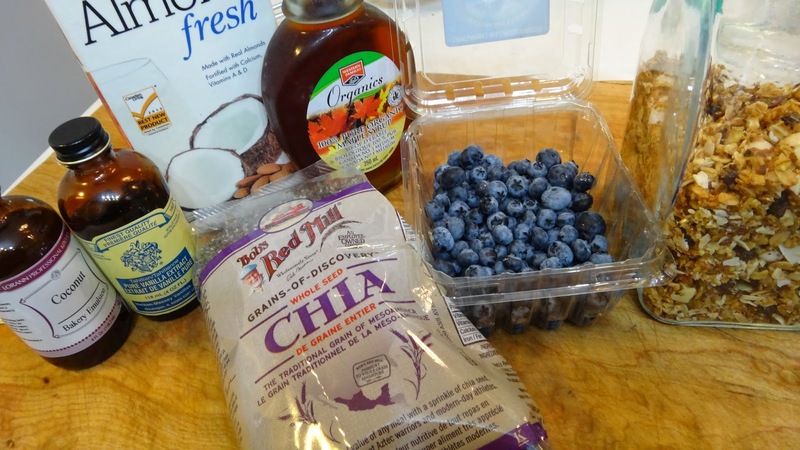 This is all you need to create a neat breakfast food that requires no cooking at all. 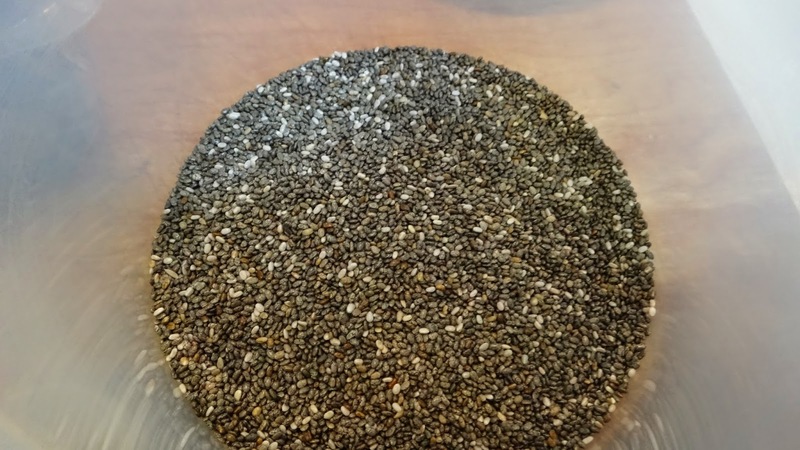 Step 1: pour your measured seeds in a container with a lid. I used a plastic container but feel free to use a glass jar or whatever you like. Step 2: add almond-coconut milk (or any milk you like!) a bit of vanilla, a splash of maple syrup and a bit of shredded coconut and mix well. 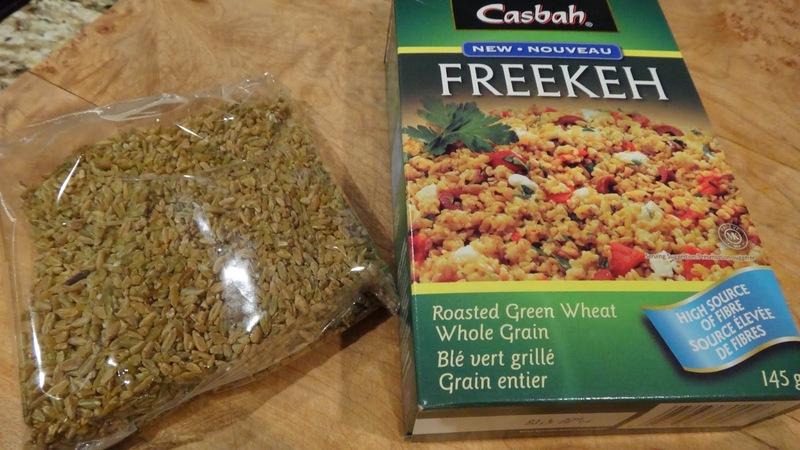 Cover the container and leave in the fridge overnight. It is pretty neat and very delicious!! Buttermilk makes everything moist and tender. I love it in breads, in chocolate cakes or it is perfect for tenderizing chicken. They always sell it in large containers so when I buy it I have to come up with multiple things to make with it to avoid wasting it. Next time you see some in the store pick it up you might just be amazed! Step 1: place buttermilk and oats in a small bowl or measuring cup and stir to combine. Microwave on high for 1 minute. Set aside to cool. Step 2: stir yeast in warm water and leave 5 minutes to bloom and activate. 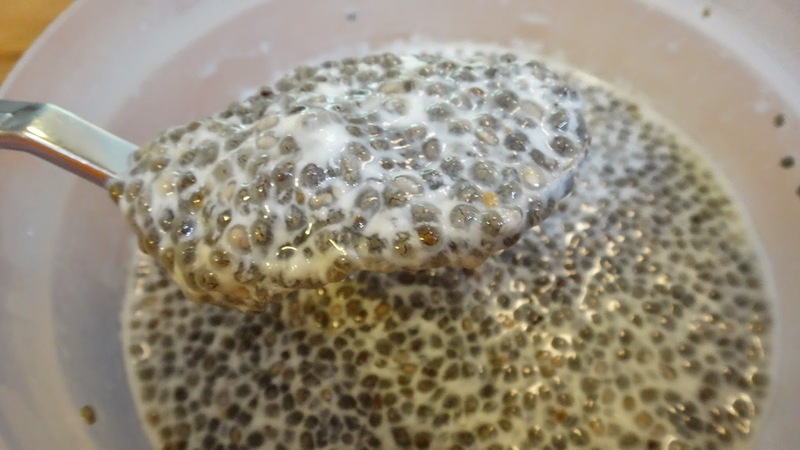 If you see yeast rise and bubble to top of water it is fresh and active. Step 3: add yeast, buttermilk oat mix, olive oil, honey and whole wheat flour into the bowl of a stand mixer or in a large bowl if mixing by hand. Mix well and leave 20 – 30 minutes. Step 4: add 2 1/2 cups of the white flour and the salt and run the mixer for 5-7 minutes to combine well. I like to remove the wet sticky dough from the mixer at this stage and combine the last 1/2 cup by hand on the counter. If you are kneading entirely by hand you will need to add all the flour and possibly a bit more on the counter. I found this amount of flour perfect for a slightly sticky dough once done. It was slightly wet however because there was oil in the dough it did not stick to my hands once I was done. Step 5: place in a lightly floured large bowl and cover with plastic. Let rise until double in size 1-2 hours (I typically let it go the 2 hours – it is more important that it be doubled rather than to focus on an exact time. Step 6: turn out dough on a lightly floured counter and deflate. Divide into two and flatten into a rectangle. 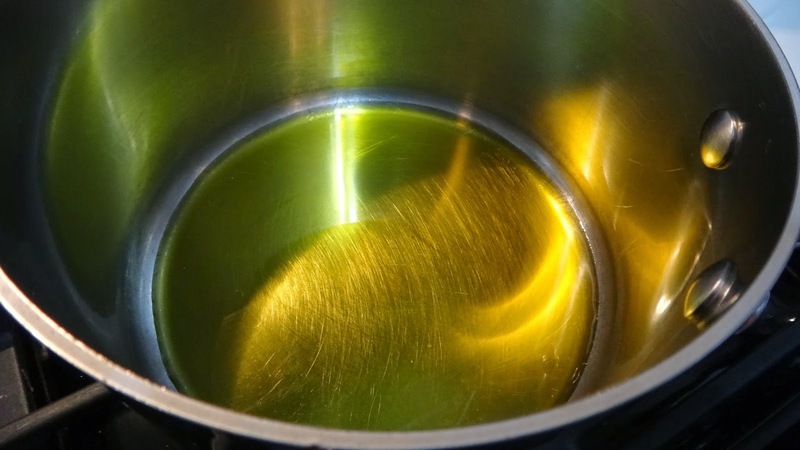 Roll up starting at the width end tightly and place in an oiled loaf pan. Cover and let rise another hour. Step 7: bake in a preheated 375 degree F oven for approx 25 – 35 minutes or until nicely browned on top. Before baking you can brush with egg wash or spray with water and sprinkle some oats on top. I used water. Turn out on cooling rack and allow to cool completely. 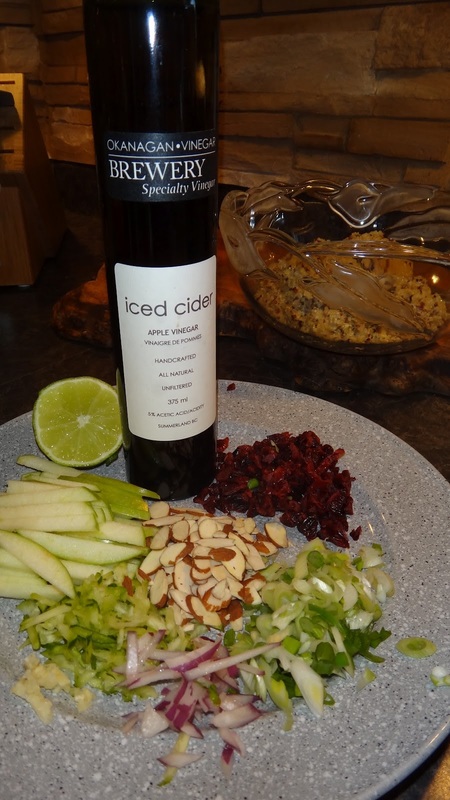 This is a great idea for lunch or a side for dinner. 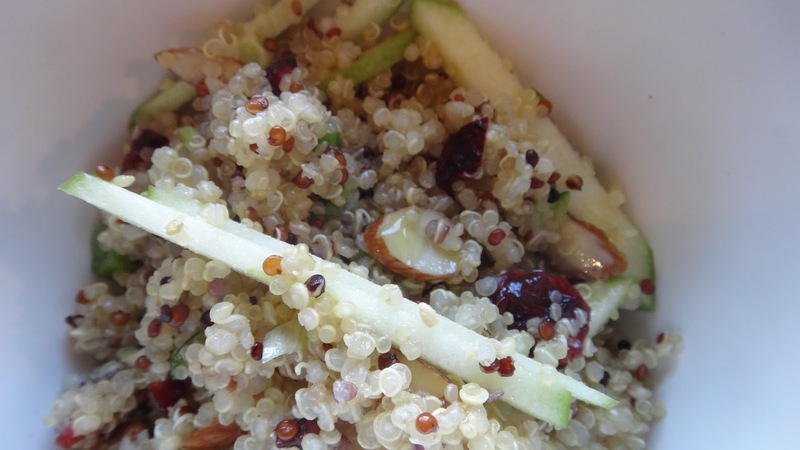 Quinoa (pronounced KEEN-WAH) is a seed that comes from the Andes mountains in South America. 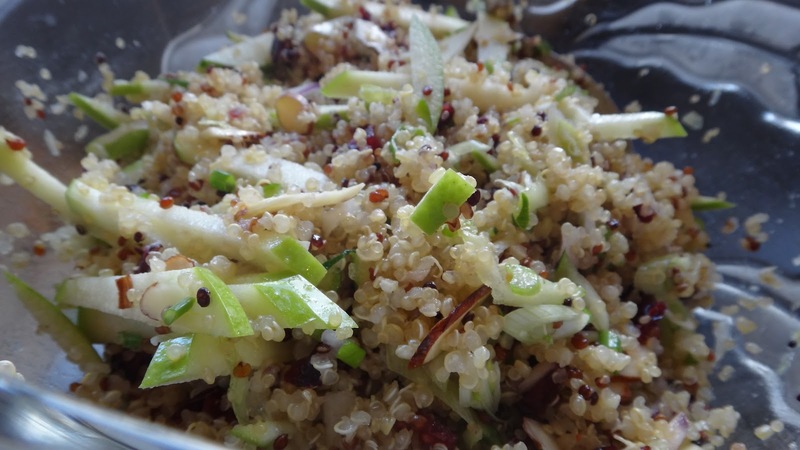 Quinoa is stocked with life sustaining nutrients including eight essential amino acids and is considered to be a Superfood. I just think it tastes good! 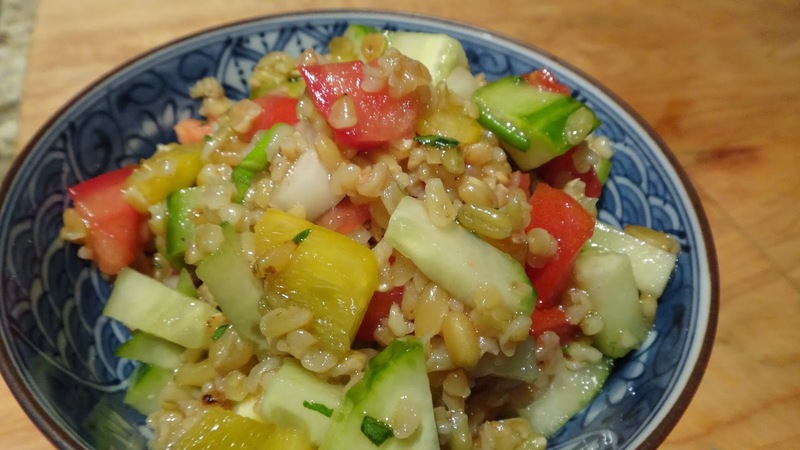 * if you double this recipe it is perfect for four or makes lots for leftovers. 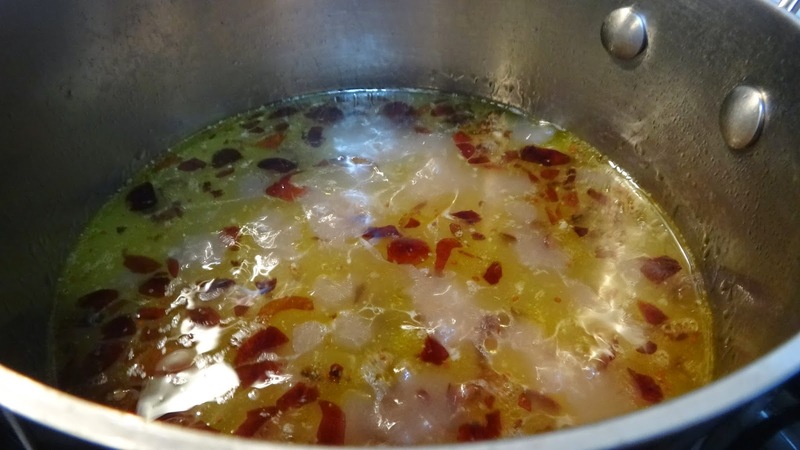 If you double the recipe you will use a full carton of broth (instead of half) and a full lime juiced and a full clove of garlic. 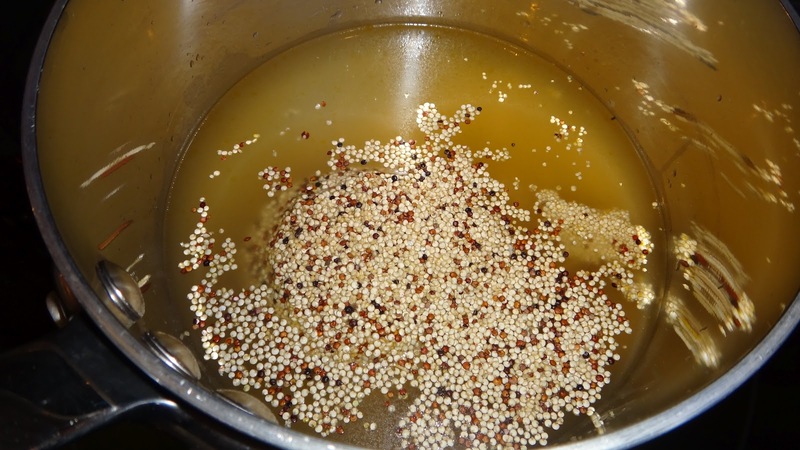 Step 1: add quinoa to boiling broth. 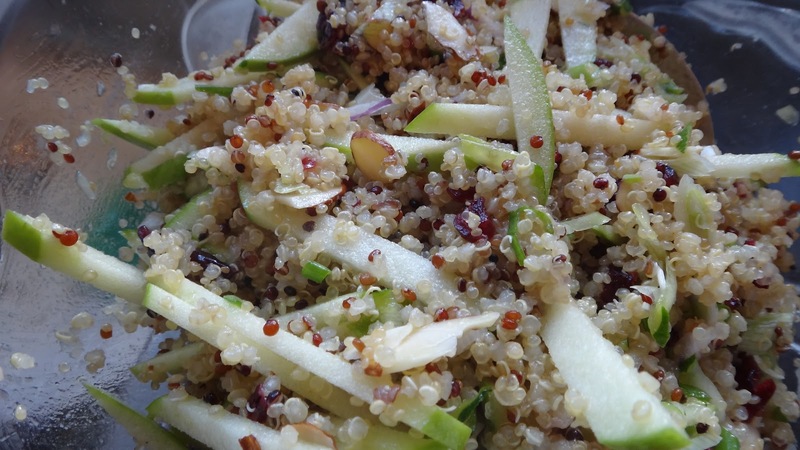 I have used a mixed quinoa (different colours) however, most quinoa you find in any grocery store is just the blonde colour. Cook for 20 minutes (drain if necessary) and cool. Step 2: assemble ingredients. 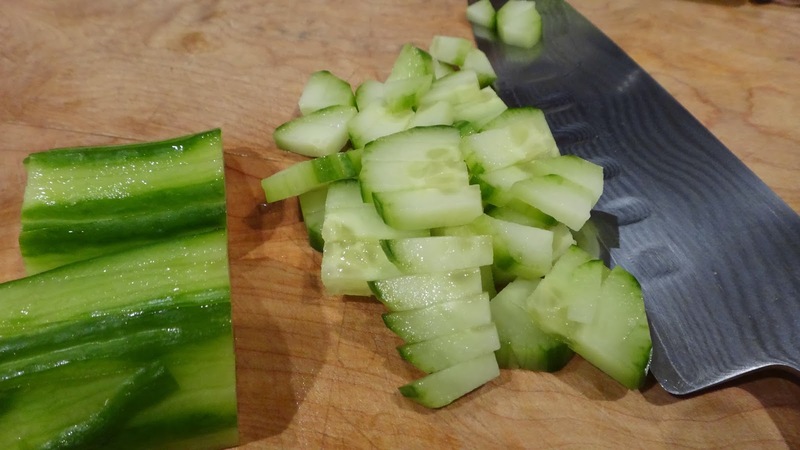 I have chopped the onions, scallions,cranberries and sliced the apples and grated the zucchini. 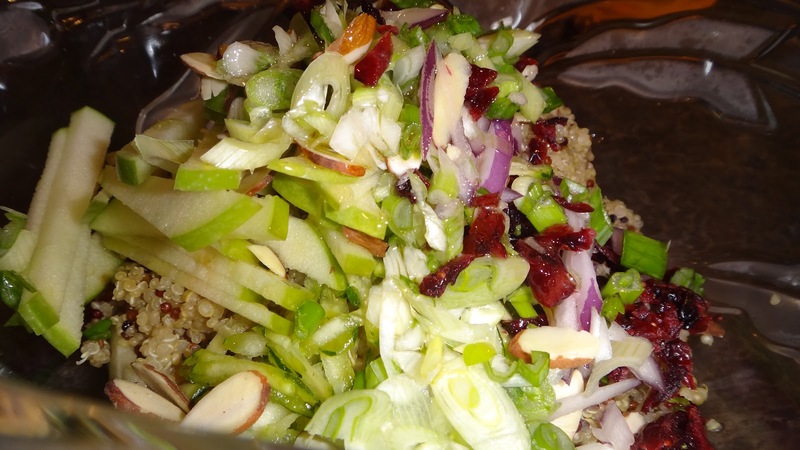 Step 3: add ingredients to cooled quinoa. 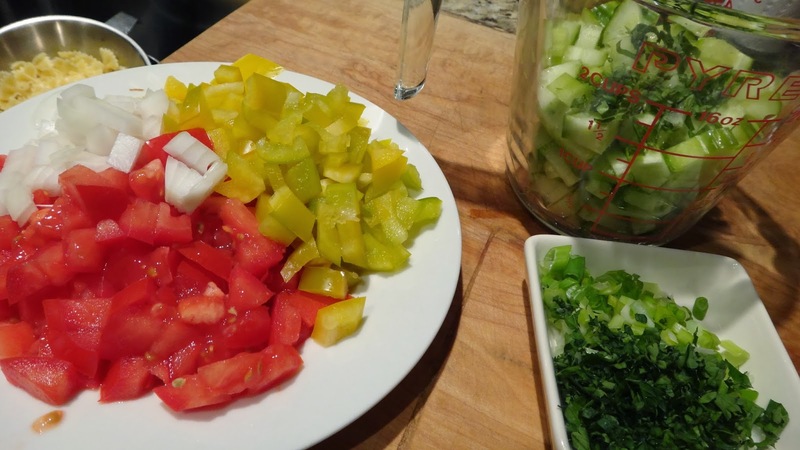 Step 4: in a small container mix dressing: cider vinegar, olive oil, lime juice, crushed garlic salt and pepper. Step 5: Toss and serve. Keeps very well for the next day.